Home > Shop By Brand > Menzerna Polishing Compounds > Menzerna Final Polish (FF 3000) PO 85U 128 oz. Menzerna Final Polish PO85U is the original finishing polish made by Menzerna of Germany for use on OEM finishes to remove minor swirls and create a high gloss, reflective finish. The polish has not been altered or watered down; this is the same polish you’d use if you were working on a car production line or in a paint shop to get a professional quality shine. Menzerna Final Polish PO85U is very similar to the Menzerna Micro Polish in terms of finish but Final Polish works faster. Extremely fine abrasives polish the paint to actually remove minor spider webbing, not just temporarily hide it. This is an important point: most finishing polishes or prewax cleaners contain solvent cleaners to clean the paint and remove minor flaws. 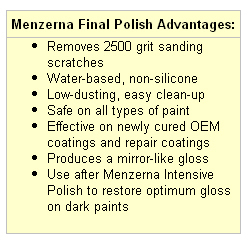 Menzerna Final Polish accomplishes the same goal through mechanical polishing action that permanently improves the paint surface and will not contribute to dulling in the long run. Menzerna Final Polish is a pure polish with no glaze, fillers, or silicones. The water-based formula contains no solvent. It is safe on fresh OEM coatings and new repair coatings. Menzerna Final Polish will not create new swirls or leave haze, and it creates no dust. It leaves only a high gloss finish on all colors and types of paint, with or without a clear coat. Mist the Wolfgang German Polish N Wax Applicator with McKee's 37 Pad Conditioner to moisten the foam. Apply a nickel size amount of Menzerna Final Polish to the applicator. Use a soft foam polishing pad, like Lake Country’s CCS Gray Finishing Pad or the White Ultrafine Pad by The Edge. Apply a 6 inch line of compound to the vehicle. With the polisher turned off, spread the polish over about a 2 x 2 sq. ft. area. Wipe the area with a damp Cobra Microfiber Towel. Menzerna Final Polish FF 3000 PO 85U 128 oz.